This is yet another on of my favorites that is easy, cheap, and versatile. 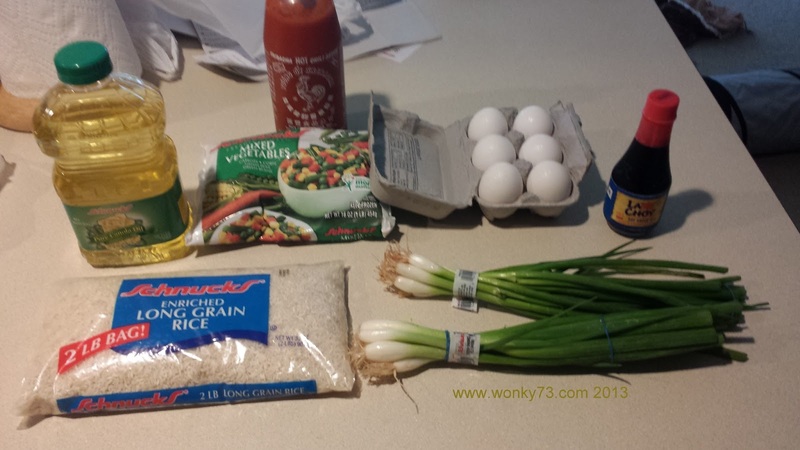 Fried rice makes a good base for almost anything. Try it with chicken, fish, all sorts of veggies, or just eat it the way I do. I prefer it plain with just some sriracha sauce. Begin cooking the rice according to the instructions. For me that meant getting two cups of water to a boil then adding the cup of rice. I then covered the pot, turned the heat down, and let the rice simmer for twenty minutes. 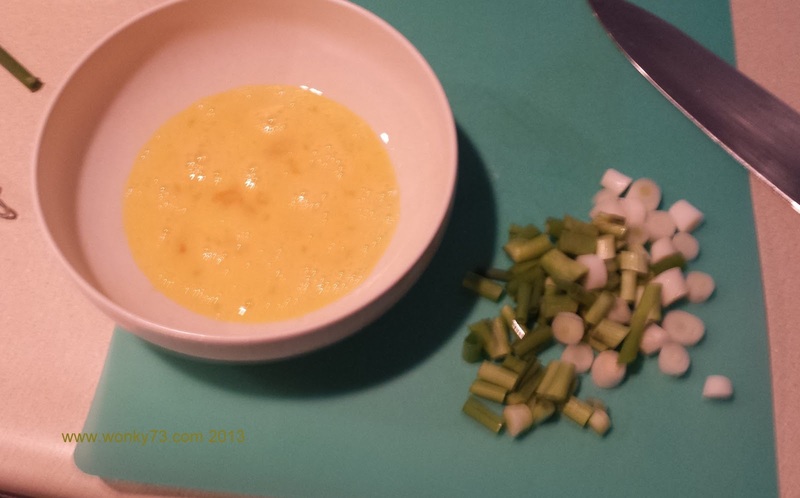 With about five minutes left to go for the rice, I chop up the green onions and whisk the eggs. I don’t go all the way to a pure yellow color like I would for an omelet. I like to leave some white in the mix. But to each their own. Now you need a big pan. I don’t know how big of a pan I used(pic below). It also helps to have a pan you don’t care about, because clean up can be a chore. Get the pan hot and add some of the oil to coat. Then dump in the eggs and I like to add the onions to try and cut the flavor a little. Stir the mixture constantly and once cooked place on a plate. At this point the rice should be done. 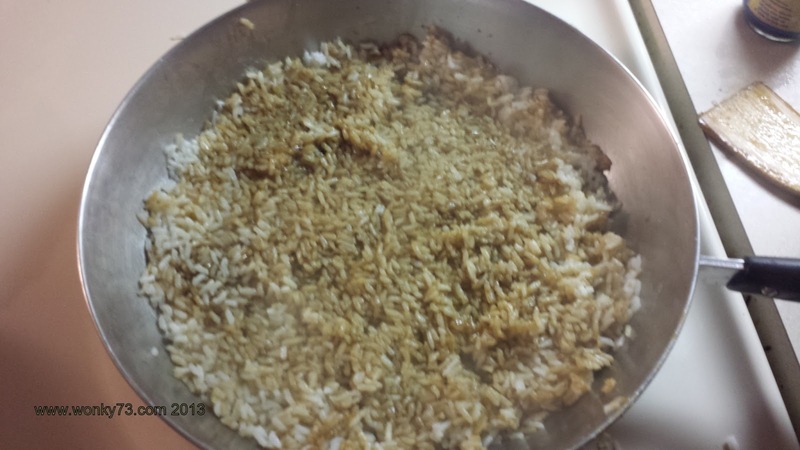 Put the rest of the oil in the pan and then dump in the rice. Using a spatula of some kind flatten out and evenly distribute the rice. Now comes the soy sauce. You need to be careful here. Add too much soy sauce and the mix becomes an over salty inedible mess. So start out using less than you think you need. You can always add more but not take extra away. After a couple of minutes start turning the rice over and packing it down again. This get as much of the rice to fry as possible. A few minutes in a add the eggs, onions, and the frozen veggies. Keep turning and cooking for around eight minutes total. If I go over ten minutes I tend to get burned bits. Viola. I took a picture of the final product but it was all blurry, Sorry.